Using primary macrophages as a model system, researchers in the Lymphocyte Development Group at the MRC LMS have identified a novel role for cohesin in the regulation of inflammatory gene expression. They show that cohesin is directly required for the inflammatory response, and for balancing self-renewal and differentiation in haematopoietic stem and progenitor cells (HSPCs). Significantly, this new role for cohesin may explain why cohesin subunits are often mutated in acute myeloid leukaemia (AML). (A) Cohesin is required for correct inflammatory gene expression in macrophages and hematopoietic stem and progenitor cells (HSPCs). 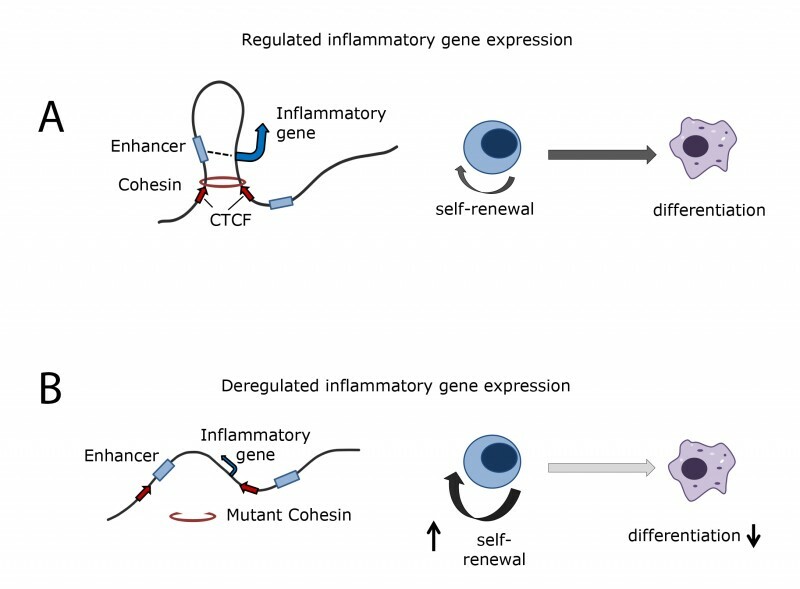 Cohesin-dependant inflammatory mediators regulate the balance between self-renewal and differentiation-inducing effects of inflammatory gene expression, decreasing the differentiation-inducing effects of inflammatory signalling on HSPCs. This shifts the balance towards self-renewal and may help explain the prevalence of cohesin mutations in AML. Cohesin is a multi-protein complex that works together with the DNA-binding protein CTCF to organise the genome in 3D space of the nucleus. Such organisation has been thought to play a key role in regulating transcription, but previous studies have shown limited impact on transcription after removal of either protein. In response to microbial stimuli, macrophages will activate a network of inducible genes, designed to generate an immune response invading microbes. The team show that genetic depletion of cohesin renders macrophages unable to appropriately activate the network upon stimulation. “We decided to analyse the role of cohesin in cells that transition from a resting to an activated state, as we thought we may see more gene deregulation than what has been observed so far in steady-state cells” says Postdoctoral Researcher Sergi Cuartero, first author of the study. In order to further understand why macrophages were unable to activate this network, PhD student Felix Weiss employed a system where cohesin could be rapidly cleaved to identify genes deregulated after the acute loss of cohesin. The team identified that genes deregulated after acute depletion were direct targets of cohesin, and also key upstream regulators of the immune response. “As a graduate student, it was great to use a novel technique to address previously troublesome questions, and understand how the data fits into the wider story”, says Felix. The group found that faulty expression of upstream regulators compounds the loss of network function: Enhancers failed to be induced mostly because the transcription factors that activate them require cohesin for expression. “For the field, this paper says that not all genes are the same and identifies that there is a need to look at why and how some genes depend on the local genome folding that cohesin causes, and why other genes do not depend on cohesin in this way” says Matthias Merkenschlager, head of the Lymphocyte Development Group. The role of cohesin in regulating the inflammatory gene response is important not just in primary immune cells, but also because inflammatory signals regulate the balance between self-renewal and differentiation in HSPCs. Inflammatory signals promote differentiation of HSPCs. In the absence of inflammatory signals, HSPCs show increased self-renewal. This may explain earlier findings that HSPCs with cohesin mutations show increased self-renewal. It could also explain the prevalence of cohesin mutations in cancers such as AML. By analysing gene expression data from human AML samples, the team found that AML cells with cohesin mutations also have reduced inflammatory gene expression, which could favour the self-renewal of leukaemic stem cells. The Lymphocyte Development group within the Epigenetics section at the LMS study transcriptional and epigenetic mechanisms that underlie cellular differentiation and response, in both health and disease. Control of inducible gene expression links cohesin to hematopoietic progenitor self-renewal and differentiation Sergi Cuartero et al. is published in Nature Immunology. By Felix Weiss, PhD student, Lymphocyte Development.